This will be the second-last image in this pollinator series, as there are plenty of great non-pollinator images in the Flickr pool and the garden’s BPotD submissions forum to share. Thanks to Eric in SF @Flickr for sharing today’s photograph with us (original via Flickr BPotD Group Pool). Much appreciated, Eric, as always! 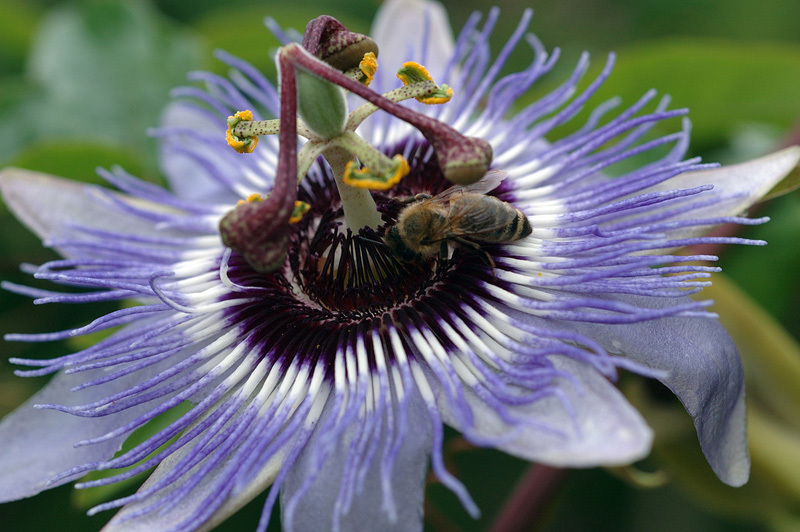 The University of Connecticut’s Ecology & Evolutionary Biology Greenhouses have a page on Passiflora caerulea with horticultural information. Wayne Armstrong provides a brief summary of economic uses, religious symbolism and toxic properties of the genus in a small write-up on Passiflora. There are three major pollinators of Passiflora and numerous minor ones. The three main ones are bees, illustrated by today’s BPoTD, hummingbirds, and bats. Hummingbird pollinated Passiflora have long tubes and a greatly reduced corona. They are also scentless, as birds are attracted by the color, not a fragrance. I really like to see the pollinators series. This is a wonderful photograph. Also the information is just great and helps me to learn something new each day. Pollination of maypops by carpenter bees is quite interesting in its geometry. While bumblebees have hairy abdomen letting them transport pollen all over their bodies and honey bees carry pollen on their legs, carpenter bees have bare abdomens and are fuzzy only on the tops of their thoraxes. That patch of fuzz is just the right height to brush the stamens and the stigmas (when the sigmas are deflexed as in this picture but not in the 2007 picture) as the bees walk around the platform working the groove. I have recently returned from a trip to the Amazon and saw the passiflora caerulea growing in the wild. It was quite a find and so gorgeous. Can’t wait to paint it.